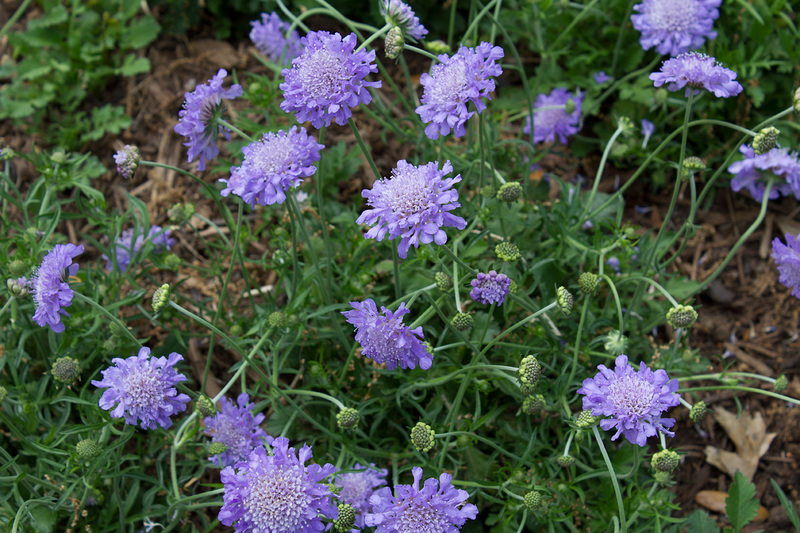 Scabiosa ‘Butterfly Blue’. The popular common name for this plant is the Pincushion flower. Even though all my scabiosas are blooming profusely now, I was amazed that they even had some blooms this past winter. In fact, they never did stop blooming. Shot over a two week period, these images are being posted just in time for Earth Day. It’s taken three years of hard work, patience, trial and error, and I have often wondered if it was in the stars for my gardens to become fully realized. Finally, there are results. This spring has rewarded me with loads of foliage and blooms. There are still areas (I call them “death gaps”) where additional and/or new replacements are required, but on the whole it’s reassuring that I haven’t wasted so much time, effort and money. In late June, I’ll photograph the gardens in their entirety, but in the meantime while the plants are filling in, here are photos of individual bloomers. (above) Calylophus hartwegii ‘Texas Gold’. 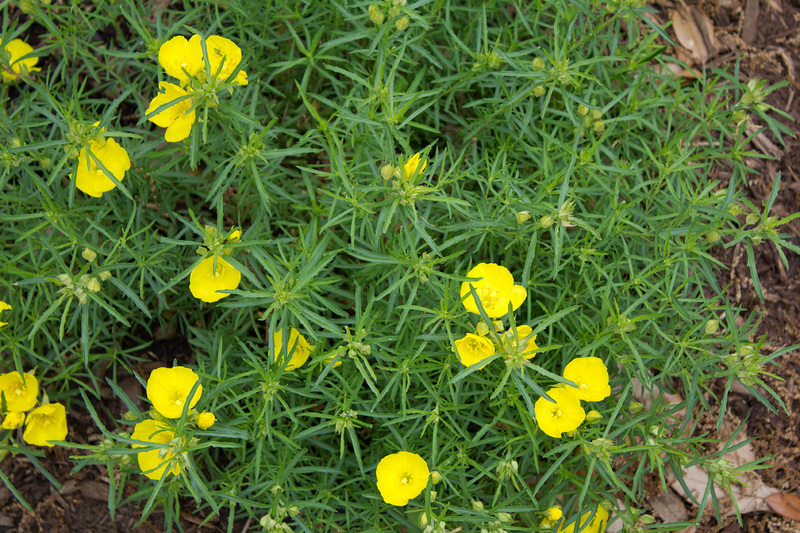 Other common names for this plant are Hartweg’s sundrops and Western Primrose. Most of these were planted late last spring, but some didn’t make it. Because I couldn’t find the Texas Gold variety, I instead planted a variety called Drummond’s sundrops (Calylophus drummondianus). I do hope the difference isn’t noticeable. (above) This parkway had to be replanted with sun tolerant perennials last year, because my neighbor’s huge oak tree that had shaded it had been removed. 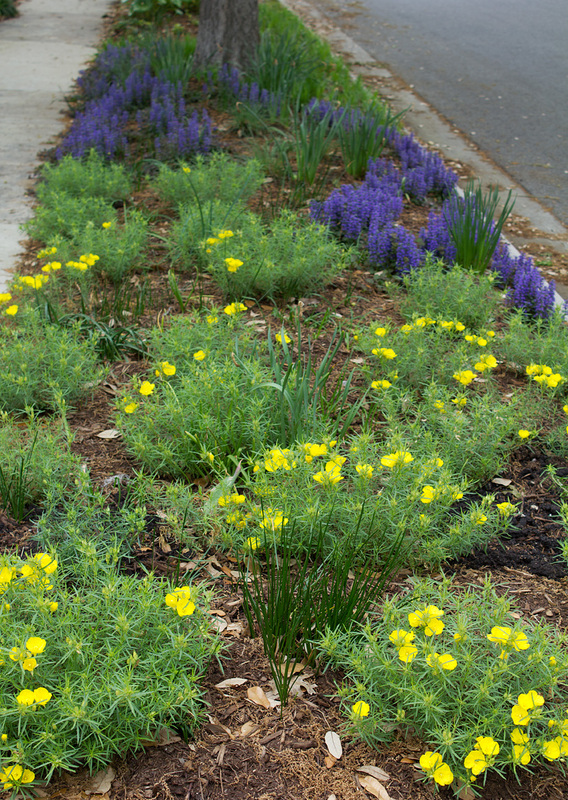 The sundrops are in the foreground, and the purple flowers further down belong to the ground cover Ajuga reptans ‘Bronze Beauty’. The bunches of vertical strappy foliage interspersed among the sun drops and ajuga belong to different varieties of rain lilies that bloom in August and September. (above) Last summer in a small rectangular bed, I planted a massive group of Four-nerve daisies (Tetraneuris scaposa) at the base of my Texas Whitebud tree. By the end of the summer, I had lost a third of the clumps, but I just cut off their dead tops and allowed the root systems to remain. I was curious to see what would happen the next growing season. And lo and behold, there’s new foliage popping up in many places along with the clumps that survived. But just in case they won’t thrive, I have added a new plant, Dwarf Coreopsis (Coreopsis auricular ‘Nana’). (above) The top plant is a Four-nerve daisy. 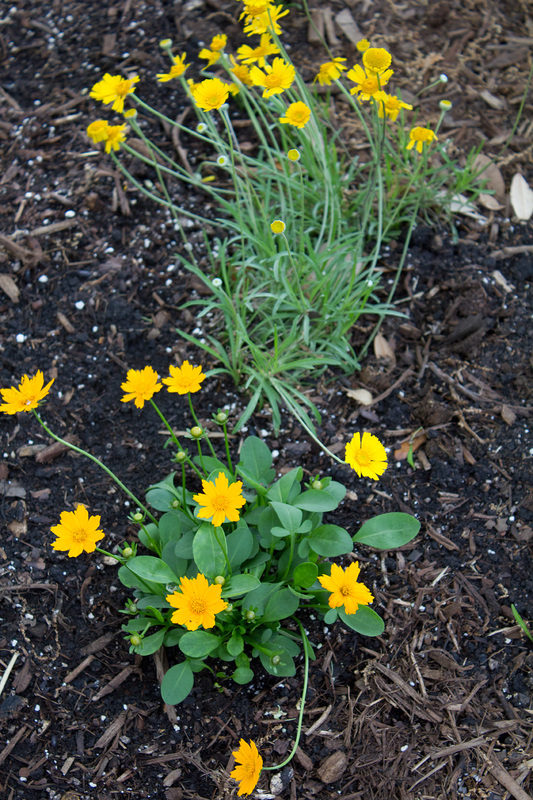 The bottom clump is one of the newly planted Dwarf Coreopsis. The Coreopsis is mainly a spring bloomer, while the daisy will bloom from now until winter. 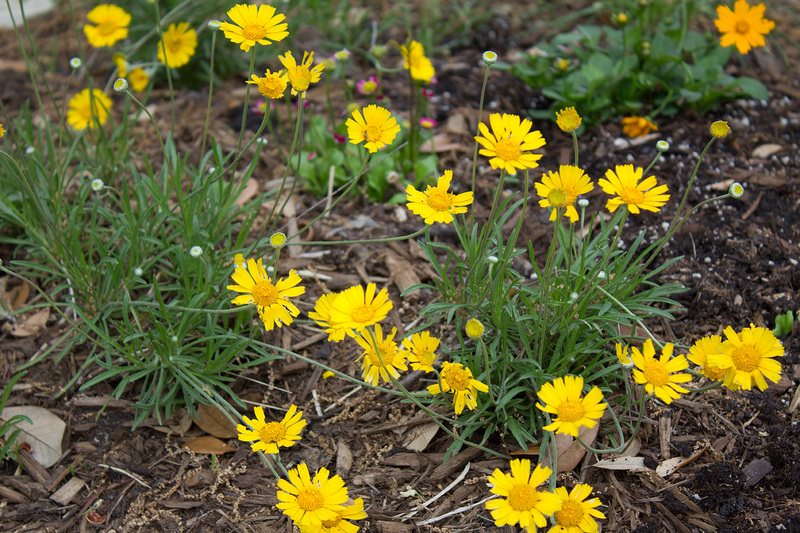 They say that the Coreopsis will spread like a ground cover, which would be so nice. I think these two complement each other in foliage texture and color. (above) In the shade portion of my backyard garden, there’s a large patch of Coral Bells (Heuchera cultivars). Originally Oxalis triangularis (False Shamrock) had been planted there, but after a second try and two growing seasons, the Oxalis refused to thrive. 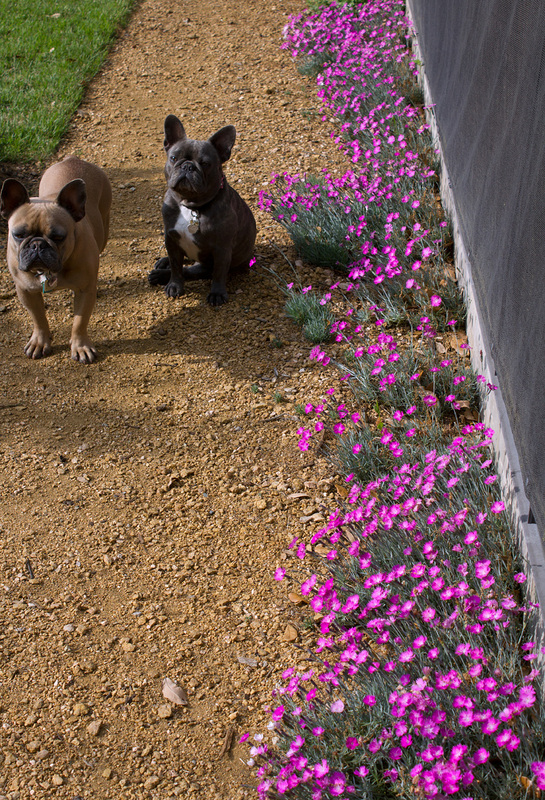 So I planted the Coral Bells. Now the Oxalis has decided to return and join the party. 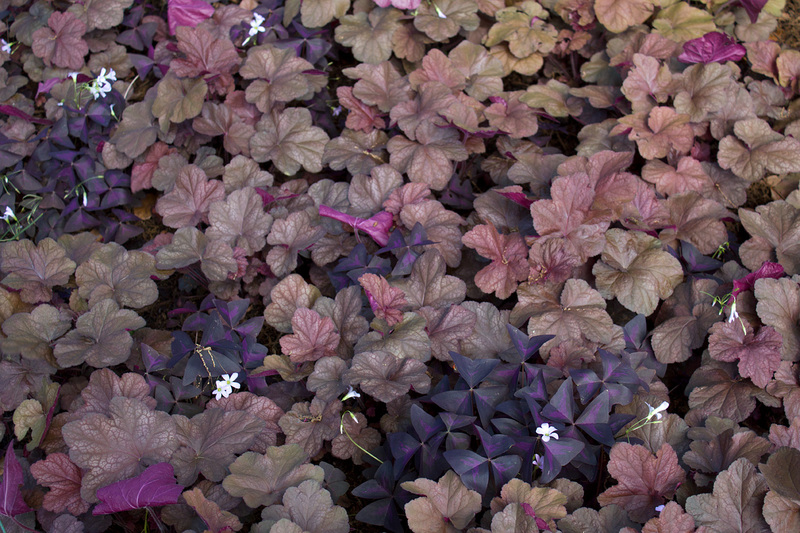 (above) Along with the Coral Bells and Oxalis, there are many other shade-loving perennials. 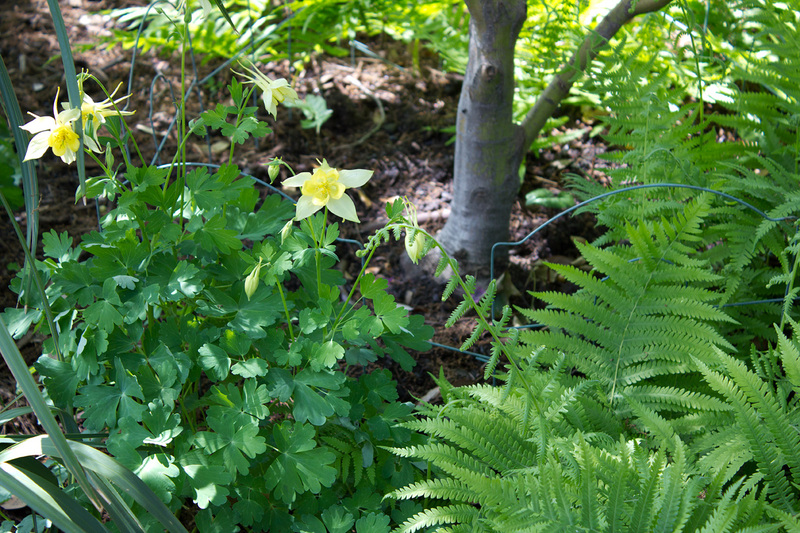 One of which is our native ‘Texas Gold’ Columbine. 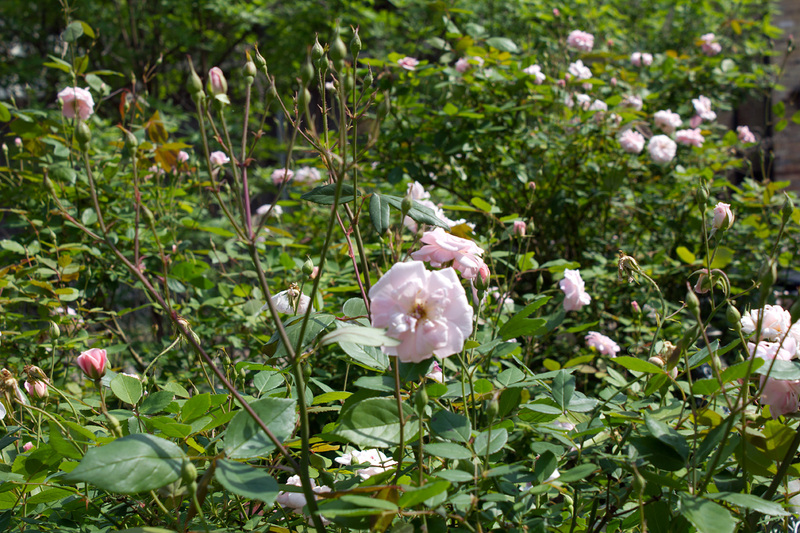 Originally it had been planted in the west area of the shade garden. Evidently it wasn’t happy there and decided to move east. Okay… whatever. (above) Brewster and Beulah have been merciful to my Dianthus gratianapolitanus ‘Firewitch’. For some reason, they like to tear apart numerous garden plants. I’ve installed temporary green fencing around the endangered areas to prevent the twins from doing any more damage. Please note that the Firewitch had already peaked a week prior to taking this photo. 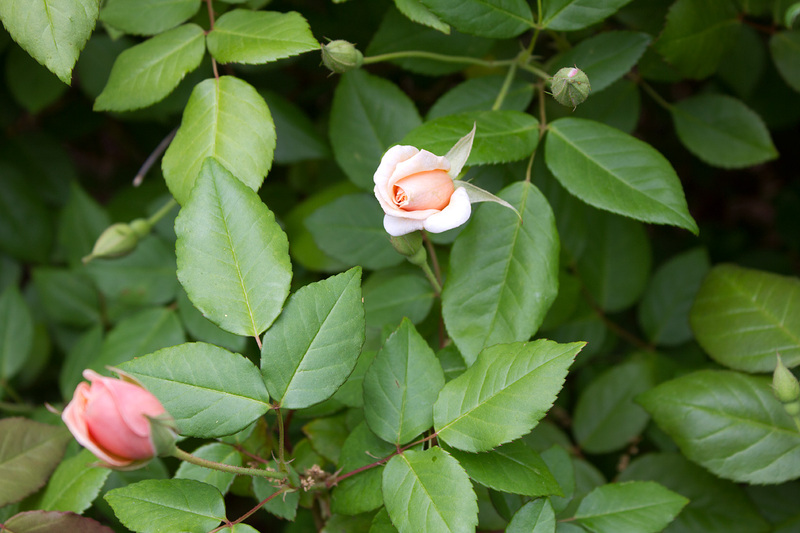 (above) New buds on one of my two Rosa ‘Perle d’Or’ shrubs. 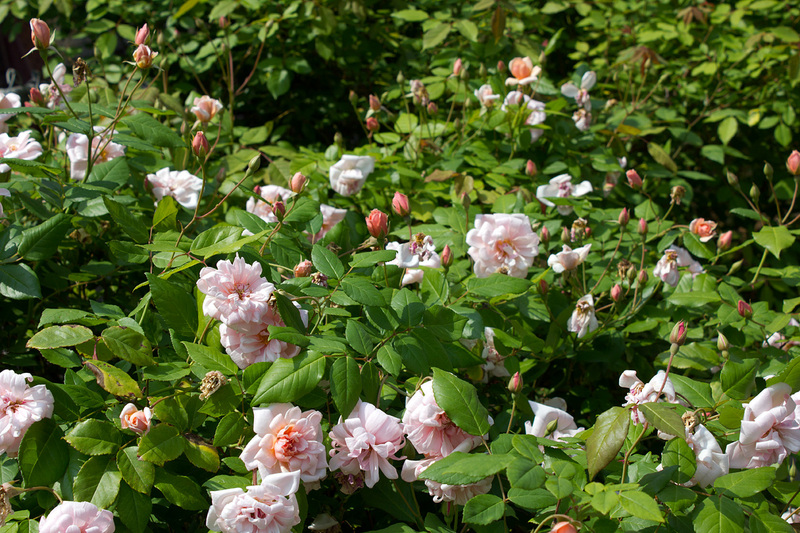 (above) The same Rosa ‘Perle d’Or’ shrub ten days later. 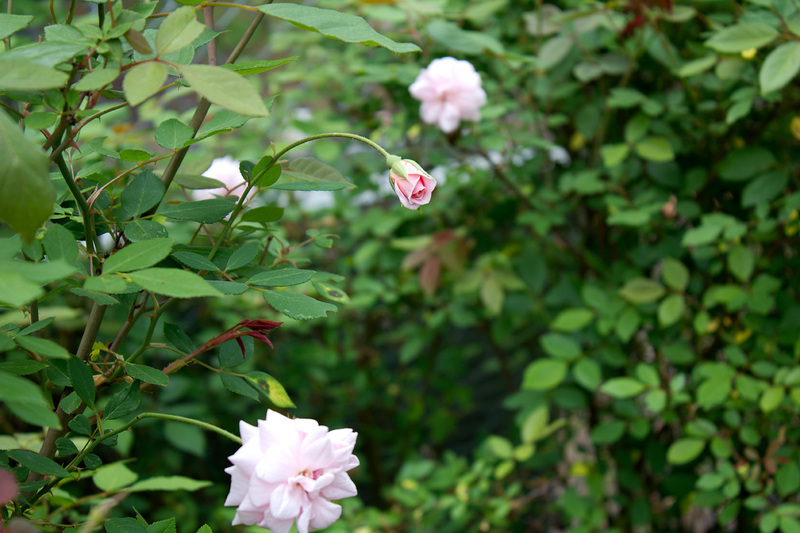 (above) New blooms on one of my six Rosa ‘Cécile Brünner’ shrubs. (above) My Rosa ‘Cécile Brünner’ shrubs ten days later.